Just this week, the White House announced that Army Capt. Will Swenson would receive the Medal of Honor for his actions in one of the most hard-fought battles of the Afghan war - in Ganjgal Valley in Kunar Province on Sept. 8, 2009. Five Americans were killed that day. Two others -- Swenson and Marine Corp. Dakota Meyer -- would receive the Medal of Honor. Now, more than four years after the battle, an extraordinary video has come to light which shows Swenson in action. This is not a recreation. It's the real thing. Swenson is the one without a helmet, while bullets flew all around. "Everybody was taking fire," said Sgt. Kevin Duerst of the California National Guard, the crew chief of a medevac helicopter that flew into the valley. "The whole valley was just a giant ambush. It was crazy." 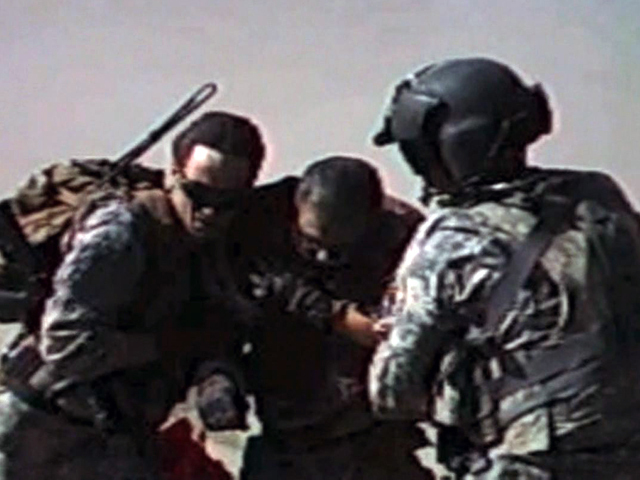 Both he and the pilot recorded the battle with cameras attached to their helmets, producing the dramatic video. Duerst first spotted Swenson from the air. "We saw him because he lay down with a panel marker," he said. "It's a bright orange panel. He was laying on his back and it was on his chest so we could see him." That panel also made him an easier target for the enemy shooting down from three sides. Sgt. First Class Kenneth Westbrook had been hit in the throat and was bleeding to death. Swenson and a medic helped Westbrook to the helicopter. Then, amid the hell of combat, something beautiful happened. "Sgt. Westbrook kind of leaned down and Capt. Swenson kind of leaned down and they had, they kind of looked at each other and it appeared that they were talking, but Capt. Swenson kissed him on the forehead and then tapped the side of his head," Duerst said. Stop the action and you can see it clearly. "It was the brotherhood," Duerst said. "It was your buddy is getting put onto a medevac helicopter and you're going to have to wait to see him for a couple hours. He's going to go back to the hospital and when you're done with your battle, then you'll see him." But Swenson never saw Westbrook again. The medevac got him to a field hospital in time for a life-saving transfusion, but 29 days later he died of complications. "This guy had four broken ribs, a punctured lung, a shattered left shoulder," said Westbrook's widow, Charlene Westbrook. "He had a shot on his neck which went through his aorta so he was bleeding pretty heavily." She did not see this video of her husband's final battle -- did not even know it existed -- until the medevac crew presented it to her this spring. "The first time I watched it was so emotional and I just, I cried," she said. "It was the hardest thing to watch." After loading Westbrook aboard the medevac, Swenson went back into the battle. When Deurst and his medevac team returned to pick up more casualties, they found Swenson further up the valley, even more exposed to enemy fire, aiding wounded Afghan soldiers and searching for four missing Americans. "He did things that nobody else would ever do and he did it for his guys and for everybody on the ground, to get them out," Duerst said. Duerst's medevac left before Swenson performed his final act of courage -- going forward under fire to recover the bodies of those four missing Americans. The army's official account makes no mention of the kiss Swenson gave his doomed sergeant. But that one act explains everything about why soldiers fight. They fight for each other.